HTLS stands for Historical and Theological Lexicon of the Septuagint! You can find its site here, and get some impression for yourself, but it surely looks interesting! There is a solid group of scholars behind the project as presented on this site, there is a further description, and a page with lots of LXX related links. There is also a page for Contact, in which you can apply for access. February 19, 2015 12:55 pm / 2 Comments on Strack-Billerbeck in English? LOGOS (Bible Software) has now put up a call for preorders on an English translation of the famous Strack-Billerbeck Kommentar zum Neuen Testament aus Talmud und Midrasch. Every NT scholar will know this work, and while there are different opinions out there about its use(fulness), it surely should be considered a valuable tool,- if used carefully. From their relevant webpage, it looks like they are halfway to an acceptable amount of pre-orders. 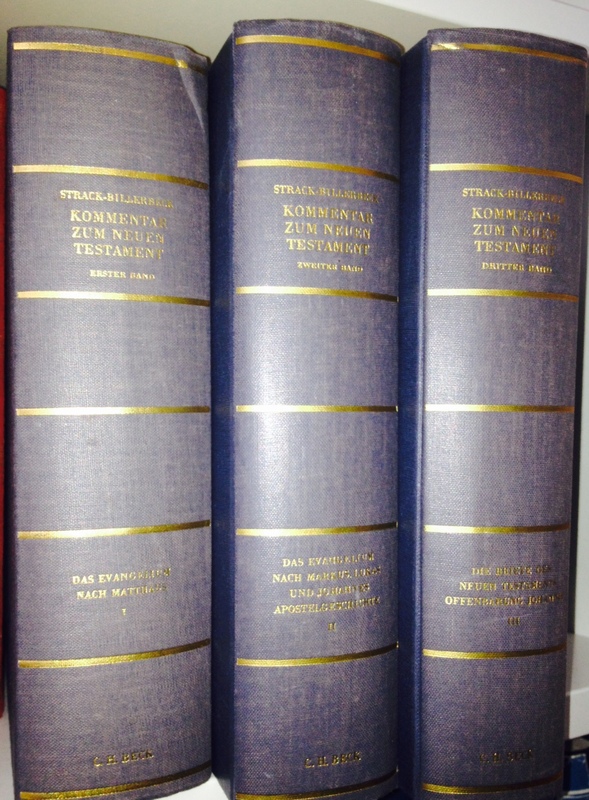 But there is more to come; Logos has made available for pre-order also the Germaan 3 volome set (Vol 1-3) of Strack -Billerbeck, for those who prefer the German language, the ur-text so to say.. GO HERE for further information. And, they are also offering the possibility of preordering the combined English and German volumes. Do you know The Schøyen Collection? The Schøyen Collection is a resource for students, academics, research institutions, publishers and all others with an interest in advancing the study of human culture and civilization, regardless of nationality, race or religion. The Collection is also a means to preserve and protect for posterity a wide range of written expressions of belief, knowledge and understanding from many different cultures throughout the ages. The whole collection, MSS 1-5527, comprises about 20,450 manuscript items, including 2,380 volumes and scrolls. Altogether 6,870 of the manuscript items are from the ancient period, 3,500 BC -500 AD. Some 3,860 items are from the medieval period 500-1500. The remaining manuscripts are from the late Renaissance up to the present. There are manuscripts from 135 different countries and territories in 120 languages and 185 scripts. See further information about its scope here. There is also a section directly related to New Testament studies, se more info here. John M. G. Barclay is about to publis his views on the apostle Paul; the volume is scheduled to be published coming fall, possibly in October. The publisher says: “In this book esteemed scholar John Barclay explores Pauline theology anew from the perspective of grace. Arguing that Paul’s theology of grace is best approached in light of ancient notions of “gift,” Barclay describes Paul’s relationship to Judaism in a fresh way. John M. G. Barclay, Paul and the Gift. Here is a recording of a lecture,”Paul and the Gift” as he delivered the first lecture for the St. Mary’s Centre for the Social-Scientific Study of the Bible (2013; St. Mary’s University College Twickenham). The famous Codex Vaticanus is now available – readable online: go to Biblioteca Apostolica Vaticana for more info. 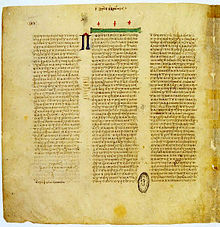 Codex Vaticanus is a codex from the4th century A.D., and is “originally contained a virtually complete copy of the Septuagint (“LXX”), lacking only 1-4 Maccabees and the Prayer of Manasseh. The original 20 leaves containing Genesis 1:1–46:28a (31 leaves) and Psalm 105:27–137:6b have been lost and were replaced by pages transcribed by a later hand in the 15th century. 2 Kings 2:5–7, 10-13 are also lost because of a tear to one of the pages. The order of the Old Testament books in the Codex is as follows: Genesis to 2 Chronicles as normal; 1 Esdras; 2 Esdras (Ezra-Nehemiah); the Psalms; Proverbs; Ecclesiastes; Song of Songs; Job; Wisdom; Ecclesiasticus; Esther; Judith; Tobit; the minor prophets from Hosea to Malachi; Isaiah; Jeremiah; Baruch; Lamentations and the Epistle of Jeremiah; Ezekiel and Daniel. This order differs from that followed in Codex Alexandrinus. (Wikipedia). Bremmer, Jan N., Initiation into the Mysteries of the Ancient World (De Gruyter, 2013), has been published now as an ‘Open Access’ book, thus downloadable to read (thanks to Larry Hurtado for the info). The book kan be downloaded in chapters (as pdf files), or as a whole. Developed and maintained by Maria Pantelia, University of California, Irvine. It has been added to my Resource Pages for Biblical Studies, in the subsection called Resources for studying the Greco-Roman world. It contains links to electronic journals, bibliographical indices, course materials, e-text archives etc., etc.